I recently enjoyed a cocktail at D.I.G. on Daniel Island, struck up a conversation with a fellow patron and discovered that she, like me, resides in Mount Pleasant. “Interesting,” I mused to myself. Yet we’re both having happy hour on Daniel Island. Of course, I was spending the week living on Daniel Island at the time, housesitting for one of my favorite families. They were vacationing in the Florida Keys and left me in charge of Zeus, their goldendoodle, as well as an array of reptiles, fish and plants. Zeus was with me at D.I.G. that day, in fact – and he’d been lots of places with me over the course of the week, much to everyone’s delight. “Aw, what a cute puppy!” several people crooned. But it wasn’t like I had to have the dog with me to get their seal of approval. Countless people waved to me from their bicycles, golf carts, cars and skateboards, making me feel right at home. Everything from independent boutiques to restaurants to frozen yogurt can be found and enjoyed on Daniel Island. It’s easily accessible from Mount Pleasant and the surrounding islands plus North Charleston, the peninsula and West Ashley. It’s also full of friendly people and regularly hosts big events. However, as a younger corner of the Lowcountry, Daniel Island is still growing a reputation of being a fun place to come and hang out. But I think people are catching on now. 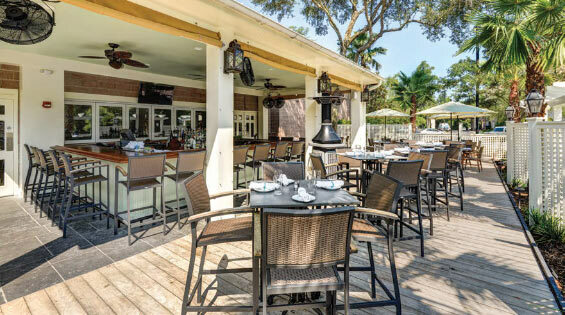 All the meals of the day – happy hour and brunch included – are addressed on Daniel Island. As a self-proclaimed foodie, I found it imperative to seek out a few new places as well as visit the favorites I’d developed over the last few years. I’m a breakfast and brunch person above all, so I didn’t hesitate to book myself a morning at Laura Alberts, where I indulged in one of my favorite versions of shrimp and grits, plus a morning at the Honeycomb Cafe, a new one for me. I should probably point out that the side of fruit at the Honeycomb is better than the usual questionable pile of pale melon – I gorged on freshly cut strawberries, pineapple and bananas while savoring my quiche. In the evenings, I tried Vespa for pizza – I suggest the pie with goat cheese and arugula – Wasabi for appetizers and cocktails – you won’t go wrong with the spring rolls – and The Islander for sushi and salads. Oh, I also had Ali Baba Deli for lunch. I should probably point out that this wasn’t all in the same day – but, knowing me, it could have been. Everyone loves a trip to the discount fashion stores, but Daniel Island has a great collection of boutiques. I popped into Blue Poppy, formerly known as Monkees, and cooed over the early autumn arrivals of jewelry, handbags and apparel. And even though I’m nowhere near getting married, I couldn’t help but steal a glance at the beautiful gowns in White, a distinctive boutique for brides to be. Taking care of business is a snap on Daniel Island. I can’t say I did much of it during my own week of leisure, but I marveled at all the convenience while Zeus and I strolled up and down the streets. Hudson & Associates CPA is there to help us with finances; Vitetta Law Group can shield us from life’s catastrophes; and CMIT Solutions can figure out our business technology snafus. Plus, you can book an exotic getaway at Vail Travel, get your eyes checked out at Island Eye Care and take your children to the doctor at Parkwood Pediatric, all without leaving the island. Maybe I’m just a freak, but I thought that running errands on Daniel Island was more fun than usual. For one thing, I could walk or ride a bicycle everywhere I needed to go, whether it was to the UPS Store, Salon Unhwa for a manicure or the nearest Redbox video kiosk. When I did gas up the trusty Saturn, I was pleasantly surprised at the price. 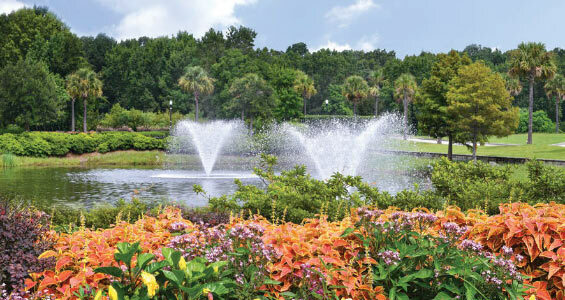 It’s no secret that Daniel Island is the destination for many of the Lowcountry’s special events. The Family Circle Cup is held each spring, and Blackbaud Stadium hosts the Southern Ground Music & Food Festival every year. I didn’t go to any major events during my weeklong stay, but I did visit the Thursday afternoon farmers market, a special Daniel Island treat all its own. I bought a homemade cookie – lemon, and very good – and met some really nice people. Someone even let me cross the street in the middle of rush hour. And I was jaywalking! I couldn’t help but feel triumphant –and lucky – as I skipped across Seven Farms Drive to my car. Of course, after a few days, or even hours, on Daniel Island, feeling lucky is part of the deal.